Exoplanets could one day hold life and are the next area of interest in space exploration. 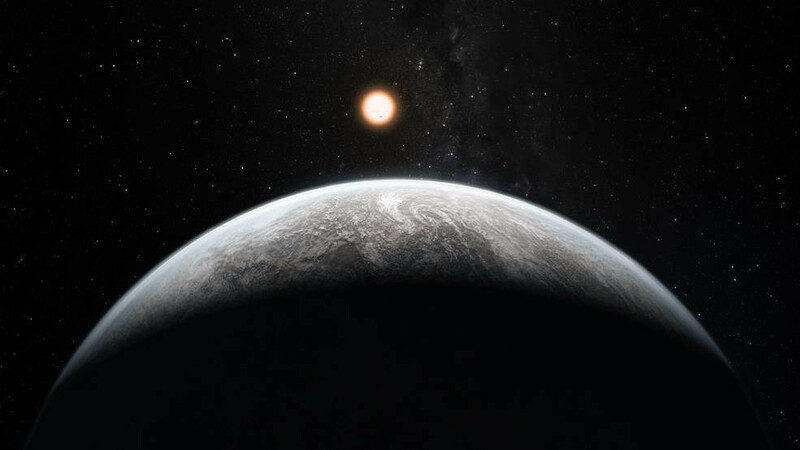 We humans have been speculating about such possibilities for thousands of years, but ours is the first generation to know, with certainty, that exoplanets are really out there. In fact, way out there. Our nearest neighboring star, Proxima Centauri, was recently found to possess at least one planet – probably a rocky one. It’s 4.5 light-years away – more than 25 trillion miles (40 trillion kilometers). The bulk of exoplanets found so far are hundreds or thousands of light-years away. The first exoplanet to burst upon the world stage was 51 Pegasi b, a “hot Jupiter” 50 light-years away that is locked in a four-day orbit around its star. The watershed year was 1995. All of a sudden, exoplanets were a thing. And a system of three “pulsar planets” also had been detected, beginning in 1992. These planets orbit a pulsar some 2,300 light-years away. Pulsars are the high-density, rapidly spinning corpses of dead stars, raking any planets in orbit around them with searing lances of radiation. Direct imaging of exoplanets – that is, actual pictures – will play an increasingly larger role, though we’ve arrived at our present state of knowledge mostly through indirect means. The two main methods rely on wobbles and shadows. The “wobble” method, called radial velocity, watches for the telltale jitters of stars as they are pulled back and forth by the gravitational tugs of an orbiting planet. The size of the wobble reveals the “weight,” or mass, of the planet. This evocative movie of four planets more massive than Jupiter orbiting the young star HR 8799 is a composite of sorts, including images taken over seven years at the W.M. Keck observatory in Hawaii. This method produced the very first confirmed exoplanet detections, including 51 Peg in 1995, discovered by astronomers Michel Mayor and Didier Queloz. 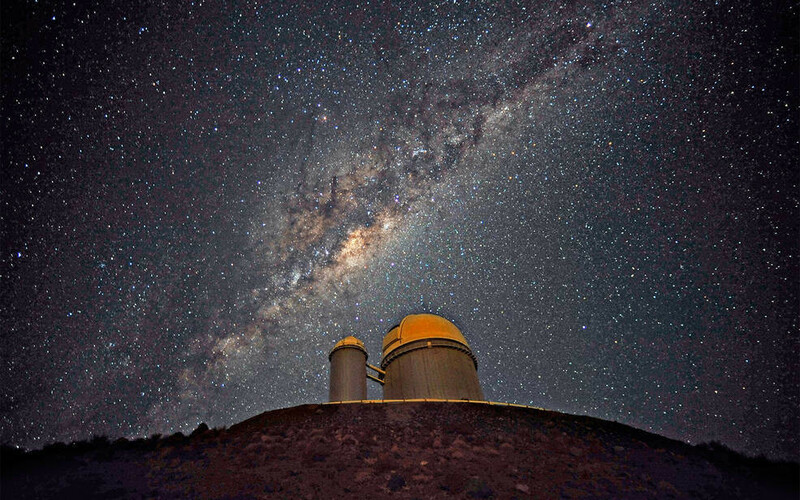 Ground telescopes using the radial velocity method have discovered nearly 700 planets so far. NASA’s Kepler space telescope, launched in 2009, has found nearly 2,700 confirmed exoplanets this way. Now in its “K2” mission, Kepler is still discovering new planets, though its fuel is expected to run out soon. The next generation of space telescopes is upon us. First up is the launch of TESS, the Transiting Exoplanet Survey Satellite. This extraordinary instrument will take a nearly full-sky survey of the closer, brighter stars to look for transiting planets. Kepler, the past master of transits, will be passing the torch of discovery to TESS. TESS, in turn, will reveal the best candidates for a closer look with the James Webb Space Telescope, currently schedule to launch in 2020. The Webb telescope, deploying a giant, segmented, light-collecting mirror that will ride on a shingle-like platform, is designed to capture light directly from the planets themselves. The light then can be split into a multi-colored spectrum, a kind of bar code showing which gases are present in the planet’s atmosphere. Webb’s targets might include “super Earths,” or planets larger than Earth but smaller than Neptune – some that could be rocky planets like super-sized versions of our own. 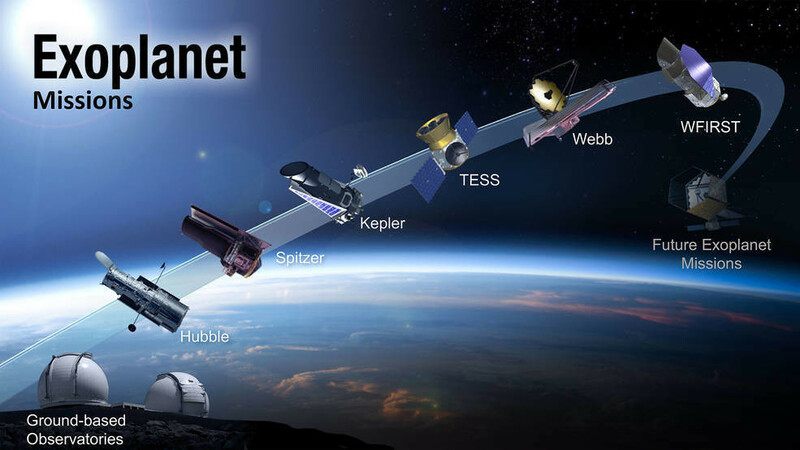 An illustration of the different missions and observatories in NASA’s exoplanet program, both present and future. This blog was originally published by NASA.